We’re getting close to the finish line with this pregnancy so I’ve been insane about finishing up all our little projects for the nursery (also called nesting)- the good news is that most of them were started long ago and are just waiting on a few final touches. For example, the dresser. 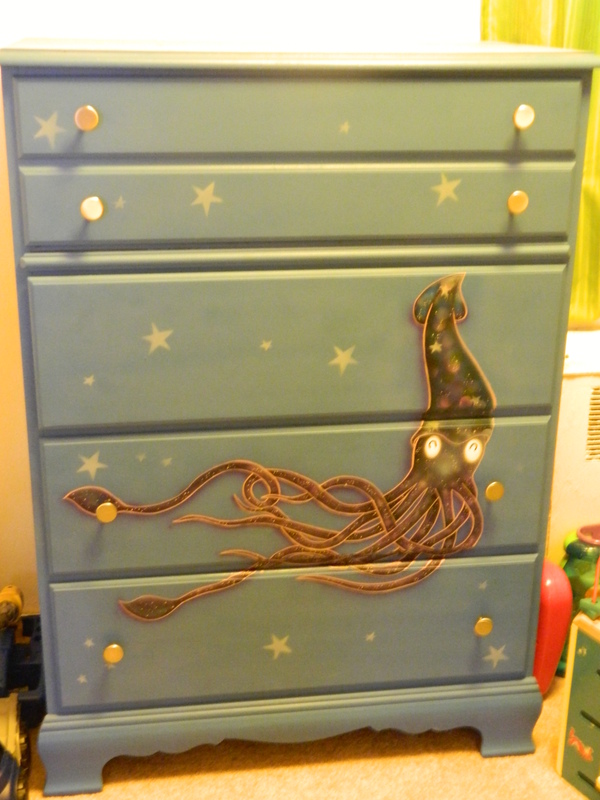 The dresser was delayed because of super humid days and lots of rain which didn’t work out so well for airbrushing with water-based paint (i.e. on humid days, it seemed hours of work could come right off if you just breathed too strongly on it). 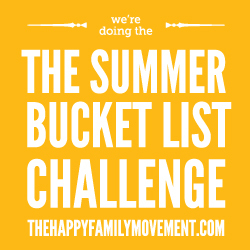 Luckily, the weather finally cooperated! 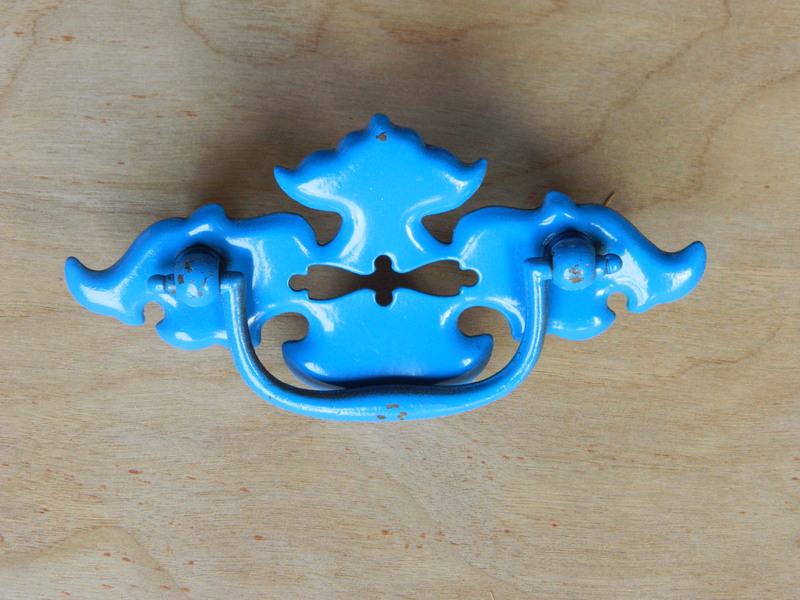 The drawer pulls were originally brass but are pictured below right after we tried painting them blue to match the dresser. Still ugly and too busy looking, so we decided to replace them with really simple round knobs. Also my husband and I both hated how noisy drawer pulls like these are (especially when your toddler figures out how to lift and drop the handles). 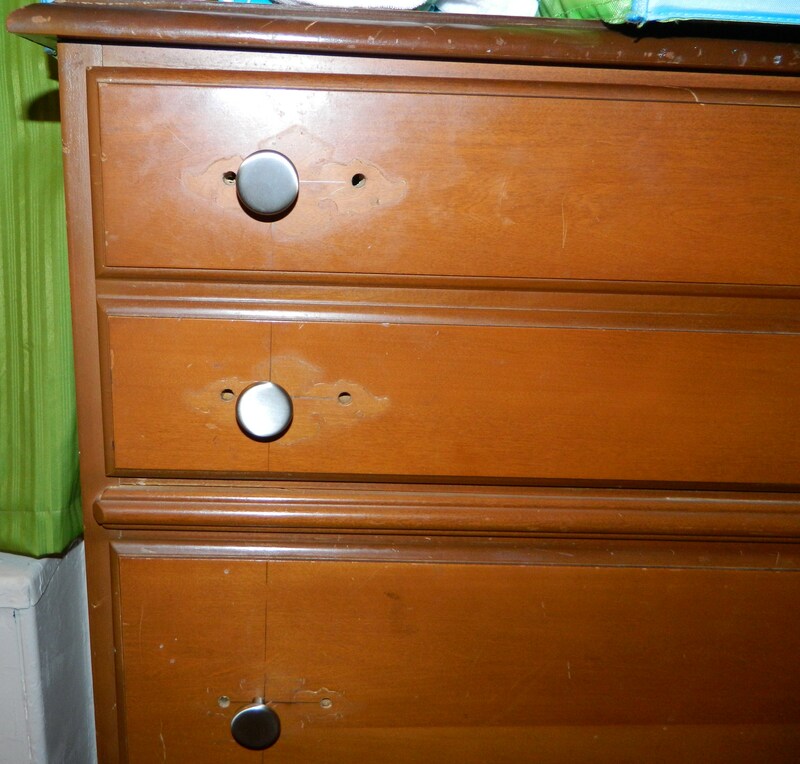 Unfortunately, the screw holes from the original drawer pulls were too large (and although we could have suffered, the outer holes seemed too far apart and the inner holes too close together) so Nick drilled new holes for our knobs and puttied the old ones. 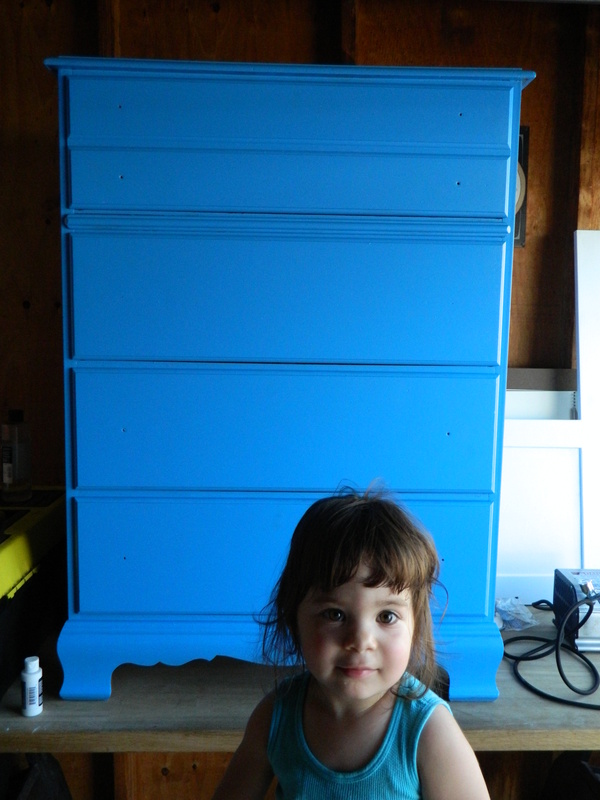 Step number 2 was to paint the dresser blue in our fabulous No-VOC Mythic Paint (we went with the Blue Cadet color). I love how just changing the color made it immediately look so much happier! I was originally voting for a white dresser but I’m glad I let Nick change my mind. And I never really noticed the cool scrolling on the bottom of the dresser until after we’d painted it – kind of like some edgy design you’d see on a piece at IKEA. (yes, I love IKEA). And the final step was my husband’s vision. 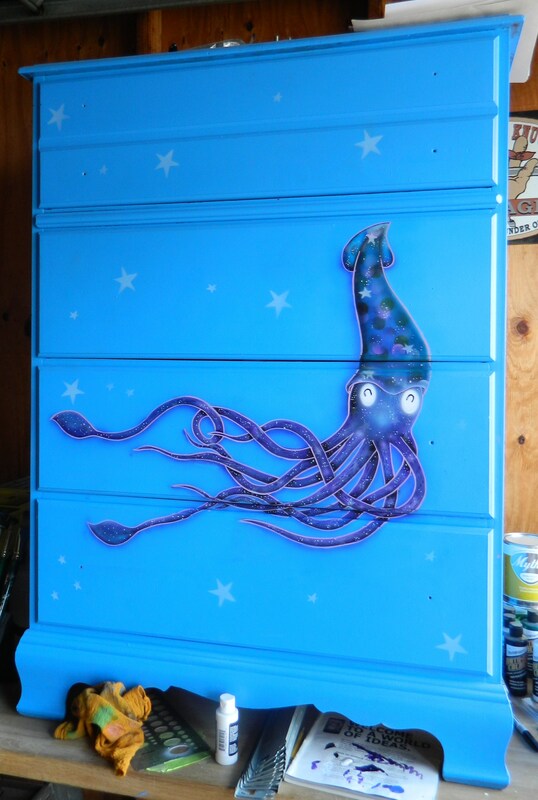 He decided on a squid, in keeping with our ocean theme, and when I mentioned that the white splatter-like detail on his tentacles reminded me of a view of the universe from space, he was inspired to add some stars as background (also our little Muffin absolutely LOVES stars). Forgot to drill holes for knobs on the test drawer – oops. And sorry about the lighting (we have a yellow sun light in the bedroom) but Ta-Da! 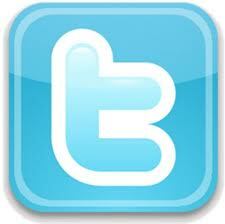 « Infant Sleep Safety – Only 31% of Blogs Contain Correct Info!